The circumcenter of a triangle is the point where the perpendicular bisectors of each side of the triangle intersect. It can be in the interior or the exterior of the triangle. The following diagram shows how to construct the circumcenter of a triangle. Scroll down the page for more examples and solutions. How to construct the circumcenter of a triangle by constructing perpendicular bisectors of each side? The construction uses only a compass and straight edge. 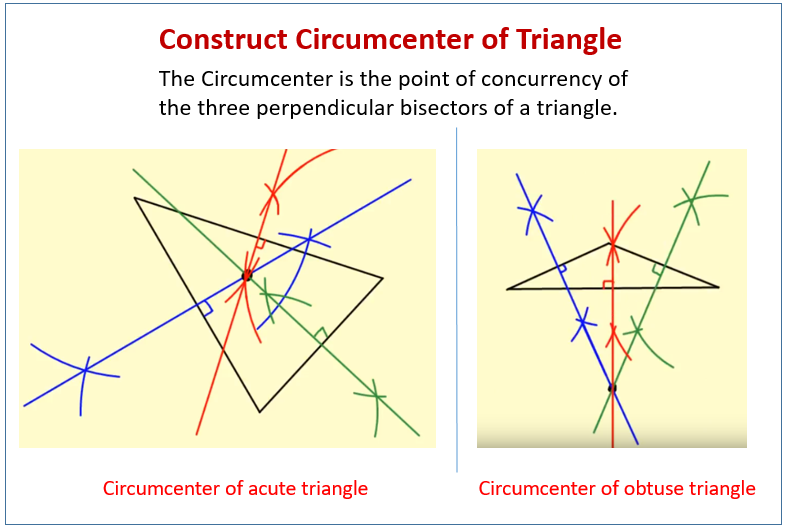 The point of concurrency of the three perpendicular bisectors of a triangle is the circumcenter. It is the center of the circle circumscribed about the triangle, making the circumcenter equidistant from the three vertices of the triangle. The circumcenter is not always within the triangle. In a coordinate plane, to find the circumcenter we first find the equation of two perpendicular bisectors of the sides and solve the system of equations. Construction of the circumcircle of a right triangle, in which it is seen that the circumcenter lies at the midpoint of the hypotenuse.